نعمتی, مهسا, حسینی, سید محسن, مدائنی, سید سیاوش, کرانیان, پروانه, جدی, فاطمه. (1395). بررسی اثر سولفوناسیون پلیمر پایه بر ویژگی های الکتروشیمیایی غشاهای نانوکامپوزیتی تبادل کاتیونی ناهمگن. نشریه شیمی و مهندسی شیمی ایران, 35(1), 99-110. 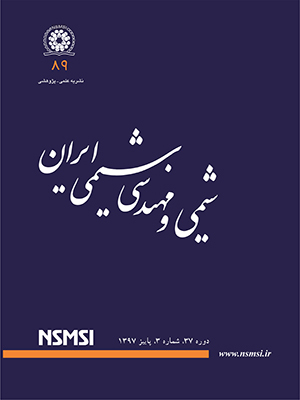 مهسا نعمتی; سید محسن حسینی; سید سیاوش مدائنی; پروانه کرانیان; فاطمه جدی. "بررسی اثر سولفوناسیون پلیمر پایه بر ویژگی های الکتروشیمیایی غشاهای نانوکامپوزیتی تبادل کاتیونی ناهمگن". نشریه شیمی و مهندسی شیمی ایران, 35, 1, 1395, 99-110. نعمتی, مهسا, حسینی, سید محسن, مدائنی, سید سیاوش, کرانیان, پروانه, جدی, فاطمه. (1395). 'بررسی اثر سولفوناسیون پلیمر پایه بر ویژگی های الکتروشیمیایی غشاهای نانوکامپوزیتی تبادل کاتیونی ناهمگن', نشریه شیمی و مهندسی شیمی ایران, 35(1), pp. 99-110. نعمتی, مهسا, حسینی, سید محسن, مدائنی, سید سیاوش, کرانیان, پروانه, جدی, فاطمه. بررسی اثر سولفوناسیون پلیمر پایه بر ویژگی های الکتروشیمیایی غشاهای نانوکامپوزیتی تبادل کاتیونی ناهمگن. نشریه شیمی و مهندسی شیمی ایران, 1395; 35(1): 99-110. در این پژوهش غشاهای تبادل کاتیونی ناهمگن بر پایه پلی وینیل کلرید با استفاده از حلال تتراهیدروفوران و پودر ذره‌های رزین تهیه شد. غشاهای مورد نظر با استفاده از روش قالب گیری محلول پلیمری ساخته شدند. در ابتدا اثر سولفوناسیون پلیمر پایه غشا و میزان غلظت آن در ساختار غشا، بر ویژگی‌های الکتروشیمیایی غشاها مورد بررسی قرار گرفت. سپس نمونه بهینه با استفاده از نانو ذره‌های اکسید آهن- نیکل، دوباره مورد اصلاح قرار گرفت. نتیجه‌های به‌دست آمده نشان می دهد که افزایش میزان غلظت پلیمر سولفونه شده در ساختمان غشاها سبب افزایش میزان آب آن (از %4/29 به %1/35) و ظرفیت تبادل یونی (از 7/2 به 2/3) شده است. همچنین غشاهای تهیه شده عدد انتقالی و انتخاب پذیری مناسبی به ترتیب در بازه‌ی 93% ـ 91% و 89% ـ 85% از خود نشان دادند. میزان شار یونی غشاها، با افزایش میزان غلظت پلیمر سولفونه شده (تا 80 درصد وزنی) روند افزایشی داشت و سپس با افزایش بیش‌تر میزان غلظت پلیمر سولفونه شده از 80 تا 100 درصد وزنی به آرامی کاهش یافت. مقاومت الکتریکی غشاها نیز با افزایش میزان غلظت پلیمر عامل دار شده در بدنه غشا به میزان %6/27 کاهش یافت. همچنین استفاده از نانو ذره‌های آهن اکسید ـ نیکل در ساختار غشاها،سبب بهبود عملکرد آنها به صورت چشمگیری شد. غشاهای اصلاح شده نانو کامپوزیتی ویژگی‌های جداسازی بهتری در مقایسه با نمونه اصلاح نشده از خود نشان دادند. مطالعه‌ها صورت پذیرفته برای صنایع الکترو ـ غشایی به‌ویژه الکترودیالیز کاربری داشتهو می‌تواند برای بهبود و افزایش میزان عملکرد سامانه‌ها مورد استفاده قرار گیرد. Hosseini SM., Koranian P., Gholami A., Madaeni S.S., Moghadassi A.R., Sakinejad P., Khodabakhshi A.R., Fabrication of Mixed Matrix Heterogeneous Ion Exchange Membrane by Multiwalled Carbon Nanotubes: Electrochemical Characterization and Transport Properties of Mono and Bivalent Cations, Desalination; 329: 62-7(2013). Farrokhzad H., Darvishmanesh S., Genduso G., Van Gerven T., Van der Bruggen B., Development of Bivalent Cation Selective Ion Exchange Membranes by Varying Molecular Weight of Polyaniline, Electrochimica Acta ;158: 64–72(2015). Kariduraganavar M.Y., Nagarale R.K., Kittur A.A., Kulkarni S.S., Ion-Exchange Membranes: Preparative Methods for Electro-Dialysis and Fuel Cell Application, Desalination; 197: 225-46 (2006). Baker RW, “Membrane Technology and Applications”, 2nd ed, John Wiley & Sons Ltd England; (2004). Shahi VK, Thampy SK, Rangarajan R., Studies on Transport Properties of Surfactant Immobilized Anion-Exchange Membrane, J. Membr. Sci; 158: 77-83 (1999). Volodina E., Pismenskaya N., Nikonenko V., Larchet C., Pourcelly G., Ion Transfer Across Ion-Exchange Membranes with Homogeneous and Heterogeneous Surfaces, J. Colloid Interface Sci; 285: 247-58 (2005). Nagarale R.K., Shahi V.K., Schubert R., Rangarajan R., Mehnert R., Development of Urethane Acrylate Composite Ion-Exchange Membranes and Their Electrochemical Characterization, J. Colloid Interface Sci; 270: 446-54 (2004). Hwang G.J., Ohya H., Nagai T., Ion Exchange Membrane Based on Block Copolymers, Part III: Preparation of Cation Exchange Membrane., J. Membr. Sci; 156: 61-5 (1999). M' Bareck C.O., Nguyen Q.T., Alexandre S., Zimmerlin I., Fabrication of Ion-Exchange Ultrfiltration Membranes for Water Treatment I. Semi-Interpenetrating Polymer Networks of Polysulfone and Poly (acrylic acid), J. Membr. Sci; 278: 10-8 (2006). Xu T., Ion Exchange Membrane: State of Their Development and Perspective, J. Membr. Sci; 263: 1-29 (2005). Elattar A., Elmidaoui A., Pismenskaia N., Gavach C., Pourcelly G., Comparison of Transport Properties of Monovalent Anions Through Anion-Exchange Membranes, J. Membr. Sci; 143: 249-61 (1998). Schauer J., Brozova L., Heterogeneous Ion-Exchange Membranes Based on Sulfonated Poly (1, 4-phenylene sulfide) and Linear Polyethylene: Preparation, Oxidation Stability, Methanol Permeability and Electrochemical Properties, J. Membr. Sci; 250: 151-7 (2005). Vyas P.V., Ray P., Adhikary S.K., Shah B.G., Rangarajan R., Studies of the Effect of Variation of Blend Ratio on Permselectivity and Heterogeneity of Ion-Exchange Membranes, J. Colloid Interface Sci; 257: 127-34 (2003). Koter S., Warszawski A., Electro-membrane Processes in Environment Protection, Polish Journal of Environmental Studies: 9/1: 45-56 (2000). Hosseini S.M., Madaeni S.S., Khodabakhshi A.R., Preparation and Surface Modification of PVC/SBR Heterogeneous Cation Exchange Membrane with Silver Nanoparticles by Plasma Treatment, J. Membr. Sci; 365: 438-46 (2010). Dlugolecki P., Anet B., Metz S.J., Nijmeijer K., Wessling M., Transport Limitations in Ion Exchange Membranes at Low Salt Concentrations, J. Membr. Sci., 346: 163-71 (2010). Hosseini S.M., Nemati M., Jeddi F., Salehi E. , Khodabakhshi A.R., Madaeni S.S., Fabrication of Mixed Matrix Heterogeneous Cation Exchange Membrane Modified by Titanium Dioxide Nanoparticles: Mono/Bivalent Ionic Transport Property in Desalination, Desalination, 359: 167–175 (2015). Farrokhzad H., Kikhavani T., Monnaie F., Ashrafizadeh S.N. , Koeckelberghs G., Van Gerven T., Vander Bruggen B., Novel Composite Cation Exchange Films Based on Sulfonated PVDF for Electro Membrane Separations, J. Membr. Sci., 474: 167–174 (2015). Shahi V.K., Trivedi G.S., Thampy S.K., Rangarajan R., Studies on the Electrochemical and Permeation Characteristic of Asymmetric Charged Porous Membranes, J. Colloid Interface Sci., 262: 566-73 (2003). Nagarale R.K., Gohil G.S., Shahi V.K., Recent Developments on Ion-Exchange Membranes and Electro-Membrane Processes, Adv. Colloid Interface Sci., 119: 97-130 (2006) . Li X., Wang Z., Lu H., Zhao C., Na H., Zhao C., Electrochemical Properties of Sulfonated PEEK Used for Ion Exchange Membranes, J. Membr. Sci., 254: 147-55 (2005). Kerres J., Cui W., Disson R., Neubrand W., Development and Characterization of Cross Linked Ionomer Membranes Based Upon Sulfinated and Sulfonated PSU Cross Linked PSU Blend Membranes by Disproportionate of Sulfinic Acid Groups, J. Membr. Sci., 139: 211-25 (1998). Hosseini S.M., Madaeni S.S., Khodabakhshi A.R., Preparation and Characterization of ABS/HIPS Heterogeneous Cation Exchange Membranes with Various Blend Ratios of Polymer Binder, J. Membr. Sci., 351: 178-88 (2010). J. Membr. Sci., 362: 550-9 (2010). Balster J., Krupenko O., Punt I., Stamatialis D.F., Wessling M., Preparation and Characterisation of Monovalent Ion Selective Cation Exchange Membranes Based on Sulphonated Poly (ether ether keton), J. Membr. Sci., 263: 137-45 (2005). Sata T., Yang W., Studies on Cation-Exchange Membranes Having Permselectivity between Cations in Electro Dialysis, J. Membr. Sci., 206: 31-60 (2002). Nagarale R.K., Gohil G.S., Shahi V.K., Rangarajan R., Preparation and Electrochemical Characterization of Cation-Exchange Membranes with Different Functional Groups, Colloids Surf. ; 251: 133-40 (2004). Sata T., "Ion Exchange Membranes: Preparation, Characterization, Modification and Application", Cambridge/United Kingdom: The Royal Society of Chemistry, (2004). Hosseini S.M., Madaeni S.S., Heidari A.R., Amirimehr A., Preparation and Characterization of Ion-Selective Polyvinyl Chloride Based Heterogeneous Cation Exchange Membrane Modified by Magnetic Iron- Nickel Oxide Nanoparticles, Desalination, 284: 191-9 (2012). Saleh T.A., Gupta V.K., Synthesis and Characterization of Alumina Nano-Particles Polyamide Membrane with Enhanced Flux Rejection Performance, Sep. Pur. Tech., 89: 245-51 (2012). Madaeni S.S., Preparation and Characterization of Microfiltration Membrane Embedded with Silver Nano-Particles, Iran. J. Chem. Chem. Eng. (IJCCE), 29(4): 105-111 (2010). Maximous N., Nakhla G., Wong K., Wan W., Optimization of Al2O3/PES Membranes for Wastewater Filtration, Sep. Pur. Tech., 73: 294-301 (2010). S.Wiks E. “Industrial Polymers Handbook: Products, Processes, Application”, WILEY-VCH Press, Germany (2001). E Mark J., “Polymer Data Handbook”, Oxford University Press Inc, New York (1999). Harper C.A., "Handbook of Plastic and Elastomers”,McGraw-Hill, New York (1975). Thomassin J.M., Kollar J., Caldarella G., Germain A., Jerome R., Detrembleur C., Beneficial Effect of Carbon Nanotubes on the Performances of Nafion Membranes in Fuel Cell Applications, J. Membr. Sci., 303: 252-7 (2007). Ohya H., Masaoka K., Aihara M., Negishi Y., Properties of New Inorganic Membranes Prepared by Metal Alkoxide Methods, Part III. New Inorganic Lithium Permselective Ion Exchange Membrane. J. Membr. Sci., 146: 9-11 (1998). Mansourpanah Y., Madaeni SS, Rahimpour A., Farhadian A., Taheri A.H., Formation of Appropriate Sites on Nanofiltration Membrane Surface for Binding TiO2 Photo-Catalyst: Performance, Characterization and Fouling-Resistant Capability, J. Membr. Sci., 330: 297-306 (2009). Xu l., Lee H.K., Sulfonated Polyvinyl Chloride Fibers for Cation-Exchange Micro Extraction, J. Chromatogr. A., 1216: 6549-53 (2009). Powell C.E., Qiao G.G., Polymeric CO2/N2 Gas Separation Membranes for the Capture of Carbon Dioxide from Power Plant Flue Gases, J. Membr. Sci., 279: 1-49 (2006). Kang M.S., Choi Y.J., Choi I.J., Yoon T.H., Moon S.H., Electrochemical Characterization of Sulfonated Poly(arylene ether sulphone) (S-PES) Cation-Exchange Membranes, J. Membr. Sci., 216: 39-53 (2003). Tanaka Y., “Ion Exchange Membranes: Fundamentals and Applications”, Membrane Science and Technology Series Elsevier, Netherlands (2007). Nagarale R.K., Shahi V.K., Thampy S.K., Rangarajan R., Studies on Electrochemical Characterization of Polycarbonate and Polysulfone Based Heterogeneous Cation-Exchange Membranes, React. Funct. Polym., 61: 131-8 (2004). Nagarale R.K., Shahi V.K., Rangarajan R., Preparation of PVA-Silica Hybrid Heterogeneous Anion-Exchange Membranes by Sol-Gel Method and Their Characterization, J. Membr. Sci., 248: 37-44 (2005). Lide D.R., “CRC Handbook of Chemistry and Physics”, 87th ed., CRC Press, Boca Raton (2006). Hosseini S.M., Jeddi F., Nemati M., Madaeni S.S., Moghadassi A.R., Electrodialysis Heterogeneous Anion Exchange Membrane Modified by PANI/MWCNT Composite Nanoparticles: Preparation, Characterization and Ionic Transport Property in Desalination, Desalination, 341: 107-114 (2014).